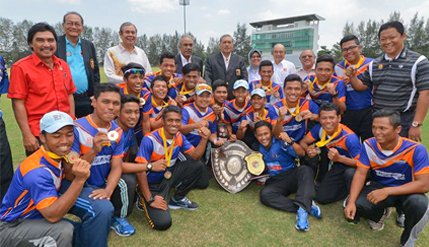 KLANG, SELANGOR, 22 Feb 2014 – The National University of Malaysia (UKM) Cricket team has again emerged champion in the Malay Rulers Shield Cricket Tournament this year. They beat arch-rivals the Malaysian Armed Forces (ATM) by 8 Wickets in the finals at the Bayuemas Oval here today to clinch their third consecutive title in the championships. The tournament was held in Klang, the UKM Oval, the Victoria Oval and the Kajang Oval from February 17 until today. In the finals today, UKM though batting without the services of its three key players who were playing in several clubs abroad did not face any difficulty in defeating the ATM team. The Malaysian Armed Forces team, who won the toss, chose to bat first in the morning session with some of their key batsmen being bowled out swiftly by the UKM fast bowlers. UKM pulled out the stops and its bowlers performed very well compared to what was seen during the group stages and the semi-finals. ATM only managed to get 72 runs. Batting in the second session in the afternoon, UKM did not have to wait long to ensure victory when they exceeded the ATM’s 72 runs with only 16 overs with the loss of 2 wickets. ATM 72 (40.5 overs) Rosman Zakaria 19 runs, Ariffin Ramly 15, Suharril Fetri Shuib 10. Munggur Yusof 3 wickets for 12 runs, Faruq Hakimin Azmi (2-12), Fauzan Malik (2-13) and Haziq Zainudin 2-20. UKM 74-2 (16.5 overs) Haziq Zainudin 30 runs not out, Adzim Yahaya 19, Faiz M. Noor 14 not out and Fikri Makram Rosdi 11. Player of the Match in the finals: Munggur Yusof (UKM). Player of the tournament : Fikri Makram Rosdi (UKM). The tournament, which was inaugurated by the Malay Rulers in 1951, is a prestigious tournament, involving the participation of the states and invitation teams from throughout Malaysia.